UAE, May 21, 2015 - Many people use mouthwash as part of their oral hygiene routine to effectively strengthen their teeth and gums. Oral rinses work by helping fight plaque and gum disease, prevent tooth decay and toothaches, and eliminate bad breath. While they have many oral benefits, some people are still worried that alcohol-containing variants, in particular, will result in a number of health risks. Several discussions have centered on the possible link between alcohol-containing oral rinse and oral cancer with no definitive answers. The new Dabur Miswak Mouthwash was recently introduced to the market as a natural mouth cleanser that contains no alcohol. The product is safe and effective to use as its main ingredient is ‘miswak,’ a thin teeth-cleaning twig used by Arabs since ancient times. Miswak comes from the Salvadora persica tree (‘Arak’ in Arabic) popularly known as the ‘Toothbrush Tree.’ Believed to be the purest form of dental cleansing, the use of miswak has been found to effectively kill germs that cause bad breath, prevent cavities, and promotes overall oral health thanks to its anti-bacterial/anti-stringent properties. 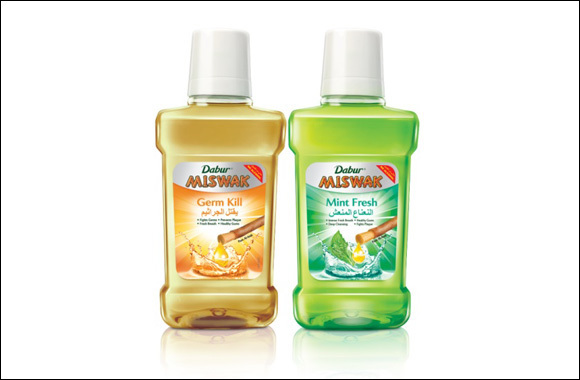 Dabur Miswak Mouthwash is available in two alcohol-free variants packed with powerful natural ingredients. The Germ Kill variant is formulated with fennel to prevent and kill germ-causing bacteria. Germ Kill fights plaque, ensures strong and healthy gums, and provides fresh breath and thorough cleansing. Mint Fresh, on the other hand, also contains effective ingredients to promote long lasting freshness, healthy gums and ward off plaque. It is fortified with peppermint oil to ensure deep cleansing of the mouth, while its mint and menthol flake ingredients provide intense fresh breath. Both variants are is available in 250ml bottles at AED 10 each.